Based on the success Cullen Jones has displayed in swimming, one would find it hard to believe he almost drowned at Dorney Park and Wildwater Kingdom in Allentown, Penn., when he was 5 years old. But, Jones turned the horrific event into a positive. He learned how to swim, and 20-plus years later, he became a gold-medal winning swimming champion in the 50-meter freestyle at the Beijing summer games in 2008. 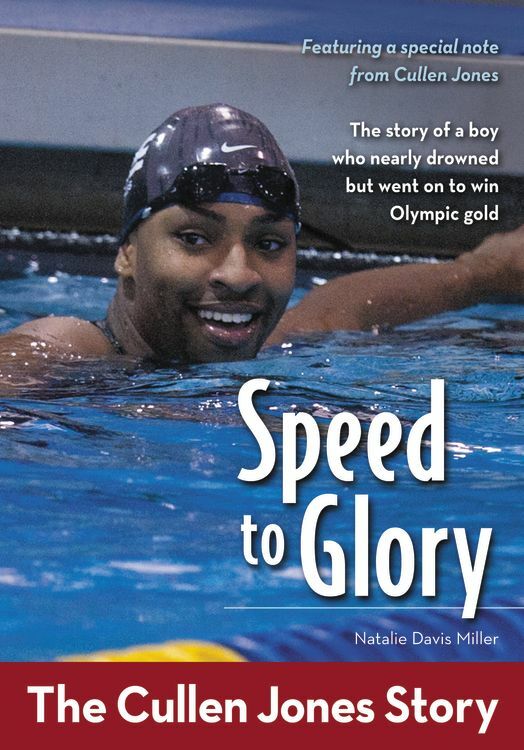 Jones, 28, the second African American in history to win an Olympic gold medal in swimming (400-meter freestyle with Michael Phelps, Jason Lezak, and Garrett Weber-Gale), places his faith, courage, and hard work in a children’s book titled “Speed to Glory: The Cullen Jones Story” (Zonderkidz; $6.99), currently in bookstores. In the 2012 London Olympics, the North Carolina State University alum will participate in the men’s 100-meter freestyle (July 31 heat), men’s 400-meter relay (July 29 heat), and men’s 50-meter freestyle (Aug. 2 heat) at the 2012 summer games. Written by Natalie Davis Miller, the book is truly inspirational. Whether it is swimming or in life, Jones wants readers to understand that commitment and trusting in God goes a long way. Miller said Jones, who lists Proverbs as his favorite book in the Bible, attended church as a teen with his father and mother, the late Ronald Jones and Debra Jones. Although he is unable to attend church on a regular basis, Cullen Jones still devotes time in his schedule. “I call on religion in every aspect of my life, whether I’m at the OIympic Games representing the USA or about to get on a plane to an event,” Jones said. In the chapter “Finding Faith,” Miller said Cullen Jones keeps faith at the core of his daily life. Jones also addresses the stereotypes about African American swimmers which exist. In chapter 12, “Make a Splash with Cullen Jones,” Miller describes how Jones came to create his swimming initiative, Make a Splash With Cullen Jones. In August 2010, Jones was taken aback by the drowning of six African American children in the Red River in Shreveport, La. This event prompted the gifted swimmer to partner with the USA Swimming Foundation and ConocoPhillips to help minorities across the country learn how to swim. In addition, Jones provides free to low-cost swimming lessons to children. “Speed to Glory” is a simple read with a strong message: honor the steps His has provided to you, work hard, and always give back to others. 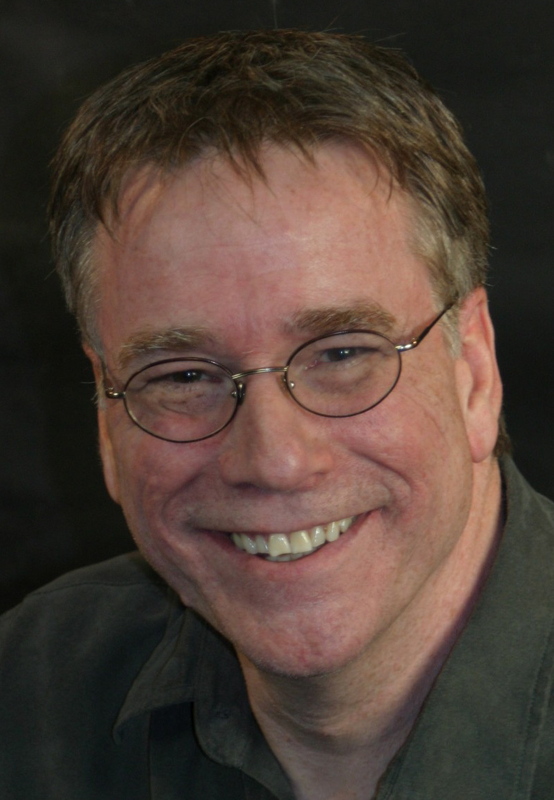 LAKE FOREST, Calif. – Dan Wooding’s career must rate as one of the most unusual in journalism. For he has gone from being a London correspondent for the National Enquirer and a staffer on the Sunday People and the Sunday Mirror, two of Britain’s raciest tabloids, to an undercover reporter and campaigner for persecuted Christians in the restricted countries of the world. And now international journalist, Dan Wooding, 71, founder of the ASSIST News Service (www.assistnews.net), has put his many years of exciting and often dangerous travel to good use in Red Dagger, his 44th book — and his first novel. The fast-moving book, much of which is based on his many years of traveling to some of the world’s hot-spots, features a Palestinian terrorist who belongs to the Red Dagger terror group from Gaza, a place that Wooding has visited several times, an Irish double agent, and a drunken American journalist who moves to London and spends too much time in a pub called “The White Hart” which had been nicknamed “The Stab in the Back” because that is where tabloid journalist gathered to verbally stab each other in the back. Wooding knows all about this journalists’ pub as it was there that he recommitted his life to Christ back in the late 1970s and went to Uganda to write “Uganda Holocaust” with Irish-Canadian, Ray Barnett, who later founded the African Children’s Choir. Each one of the characters finally finds redemption in their twisted lives, but not before much mayhem has been committed and the world had stood on the edge of complete disaster. This, said Wooding, has included the time he was arrested and locked up in a cell in Lagos, Nigeria. Also when he and a colleague were in a hotel in San Salvador, El Salvador, when a car bomb exploded in the parking lot and badly damaged the hotel and, finally when he and his wife Norma were held up by terrorists in Bethlehem and were going to be shot by them. That was until a quick-thinking Arab taxi driver saved their lives by explaining they were visitors from the USA. 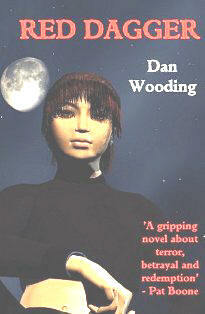 Red Dagger has already received interest from movie producers and praise from various celebrities who have read it. So if you want to enter the dark and dangerous world of international terrorism and be inspired with its conclusion, this is the book for you, or even for a friend who loves good novels. It is also available as an e-Book file download. PLANO, Texas – Bob Hostetler has a message for Christians – quit going to church. He also tells us to quit saying prayers, quit reading your Bible, quit volunteering, quit enjoying fellowship, and so on. While all these requests sound a bit far-fetched, think again. This thought-provoking and “pull-of-the-gloves” book is based on the premise that much of how we think and act, a great percentage of what we do today as church-going people, bears a slight resemblance to the way of Jesus and “the faith that was once for all delivered to the saints” (Jude 1:3 NIV). The title of the book and its subsequent chapters issue an eyebrow-raising challenge, showing how many of us have misunderstood and distorted the good news of Jesus and replaced Christianity with something else. For instance, in the chapter “Quit Going To Church,” he points out that Christians should “stop going to church and start being a church” that resembles the one in Acts 2. What should a church look like? Hostetler said it should be holy (“spirituality” and “being the church”), catholic (“universal” and “all of us together”), and apostolic (“based on the teachings of the apostles” and “provide gift-based leadership”). Furthermore, Hostetler tells readers to shy from the long-held notion by some that going to church makes you a Christian. This portion of Hostetler’s book takes me to James 2:14-26, when James talks about faith and deeds. What are you doing to fulfill Christ’s kingdom Monday through Saturday? Hostetler contends Christians should quit tithing because the practice is misrepresented in today’s church. Everything we have belongs to God. Therefore, if you truly understand the New Testament church, 10 percent or any portion that man constitutes as tithing is incorrect. Jesus wants His people to surrender all to Him. Not 10 percent, but 100 percent. Everything! (Luke 14: 25-34). Sadly, some have swayed from the Christ’s roadmap for His church. Hostetler is attempting to convey in “Quit Going to Church” that traditions and customs were not a part of first century Christianity and it should not have a place in the 21st century church. This straightforward title has nothing to do with “denomination” or who is right or wrong. But, if you believe in Him with all your heart, you would adhere to Christ’s vision for His church. Learn more about Hostetler at www.bobhostetler.com. To purchase this book, visit Leafwood Publishers. GRAND RAPIDS, Mich. – We live in a world where there are 145 million orphans, where a child dies of hunger every five seconds, where 925 million people are chronically undernourished, and 1.1 billion lack access to potable water. When the need is so overwhelming, making a difference often feels like an impossible task. Does helping just one person really matter? 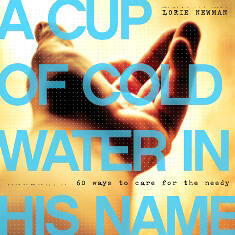 In her new book, “A Cup of Cold Water in His Name: 60 Ways to Care for the Needy” (Discovery House, April 2012, 978-1-57293-512-9, paperback, $12.99), author Lorie Newman reminds us that God calls every Christian to help the millions of forgotten, impoverished, and hurting people in the world. In Matthew 25:40, Jesus says, “I assure you, when you did it to one of the least of these my brothers and sisters, you were doing it to me!” So as Newman says, that one definitely matters. “She wrote A Cup of Cold Water in His Name to equip Christians with practical ways to care for the needy in their everyday lives. In it, she shares 60 ideas inspired by real-life stories of people making an impact, and passes on resources, websites and ministry contacts – everything needed to inspire us to become the hands and feet of Jesus, said Stephanie Ridge of PR by the Book. needs, addressed in Mathew 25: feeding the hungry, being hospitable, clothing the naked, caring for the sick, and ministering to the prisoner. * Keep five-dollar gift cards in your purse or wallet for the needy. * Participate in a local produce co-op or buy in bulk. * Provide respite care for foster families. * Organize a block party in a needy area. * Form a support group at your church for people infected with or affected by HIV/AIDS. * Teach life skills to foster children who are aging out of the system. She is a frequent speaker at Christian retreats and ministry events, and has taught Bible studies and led prayer groups for more than 15 years. 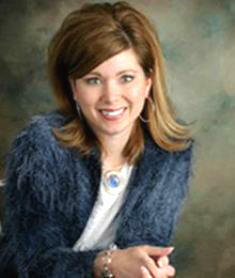 Learn more at www.LorieNewman.com and http://lorienewmanblog.typepad.com.